10-inch reflector from my moderately light polluted backyard with a 5.8 NELM. It was an especially good night with excellent transparency. M40, a pair of 10th magnitude stars, also known as Winnecke 4 is very easy with a wide separation of about 50 seconds of arc. The pair is oriented mostly east-west and both appear as whitish-yellow in color. Two faint galaxies are located very close to M40. All three objects are located within a 1/2º field-of-view. Just to the west of M40, lies faint galaxy NGC 4290 at 12.0 magnitude, elongated NNE-WSW. A very subtle brightness could be seen in the central region. Very close and to the west of NGC 4290 is very faint 14th magnitude galaxy NGC 4284, which is extremely difficult, appearing as a faint mostly round blur. 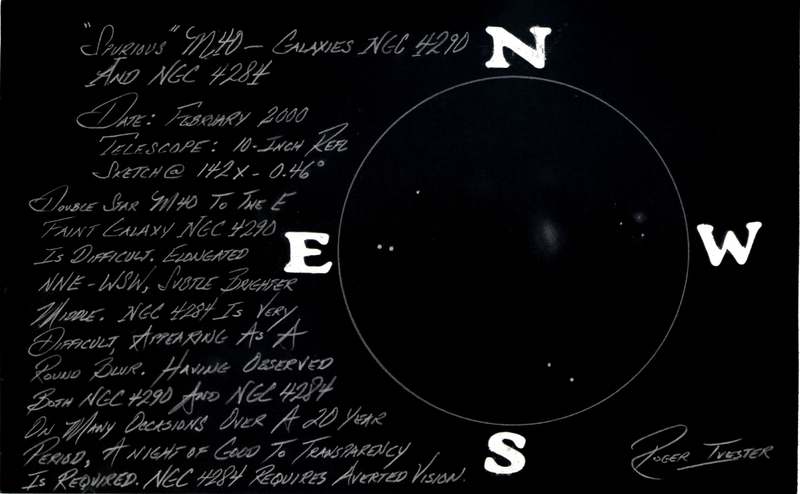 During a previous observation from the same location and in a side-by-side comparison with the 10-inch reflector, NGC 4284 could not be seen with an 8-inch Schmidt-Cassegrain telescope. The following sketch was made using various graphite pencils and a blank 5 x 8 notecard with the colors inverted using a scanner. This entry was posted on June 24, 2014 at 1:49 am and is filed under Work File Only - Observer's Challenge Reports. You can subscribe via RSS 2.0 feed to this post's comments. Both comments and pings are currently closed.